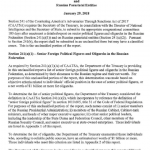 Section 241 of the Countering America’ s Adversaries Through Sanctions Act of 2017 (СААTSA) requires the Secretary of the Treasury, in consultation with the Director of National Intelligence and the Secretary of State, to submit to the appropriate congressional committees 180 days after enactment а detailed report оп senior political figures and oligarchs in the Russian Federation (Section 241 (a)(l)) and on Russian parastatal entities (Section 241 (а)(2)). Pursuant to Section 241(Ь), the report shall Ье submitted in an unclassified form but may have а classified annex. 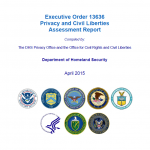 This is the unclassified portion of the report. 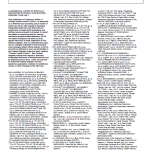 In accordance with Section 242 of PuЬlic Law 115-44 (P.L. 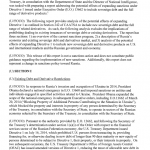 115-44) (“Countering America’s Adversaries Through Sanctions Act” (CAATSA)), the U.S. Department of the Treasury, in consultation with the Department of State and the Director of National Intelligence, was tasked with preparing а report addressing the potential effects of expanding sanctions under Directive 1 issued under Executive Order (Е.О.) 13662 to include sovereign debt and the full range of derivative products. After the September 11, 2001 terrorist attacks, the United States adopted a preventive approach to combating all forms of terrorist activity. Efforts to combat the financing of terrorism (CFT) are a central pillar of this approach. Cutting off financial support to terrorists and terrorist organizations is essential to disrupting their operations and preventing attacks. 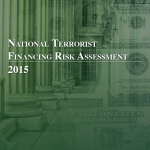 To that end, the U.S. government has sought to identify and disrupt ongoing terrorist financing (TF) and to prevent future TF. The law enforcement community, including various components of the U.S. Departments of Justice, Homeland Security, and the Treasury, along with the intelligence community and the federal functional regulators, applies robust authorities to identify, investigate, and combat specific TF threats, enforce compliance with applicable laws and regulations, and prosecute supporters in order to deter would-be terrorist financiers. The U.S. Department of the Treasury (Treasury), which leads financial and regulatory CFT efforts for the U.S. government, employs targeted financial sanctions, formulates systemic safeguards, and seeks to increase financial transparency to make accessing the U.S. financial system more difficult and risky for terrorists and their facilitators. All of these efforts involve extensive international engagement to try to prevent any form of TF, particularly financing that does not necessarily originate in the United States, from accessing the U.S. financial system. 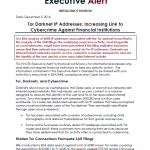 Our BSA analysis of 6048 IP addresses associated with the Tor darknet found that in the majority of the SAR filings, the underlying suspicious activity, most frequently account takeovers, might have been prevented if the filing institution had been aware that their network was being accessed via Tor IP addresses. Darknets are Internet based networks used to access content in a manner designed to obscure the identity of the user and his or her associated Internet activity. 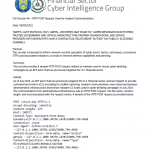 As of July 2015, an APT actor that has previously targeted the U.S. financial sector used an implant to provide command and control (C2), according to credible reporting. Implant communications were observed between administrative infrastructure and known malware C2 nodes used in spear-phishing campaigns in July 2015. The communication from administrative infrastructure was an HTTP POST request. This publication of Treasury’s Office of Foreign Assets Control (“OFAC”) is designed as a reference tool providing actual notice of actions by OFAC with respect to Specially Designated Nationals and other persons (which term includes both individuals and entities) whose property is blocked, to assist the public in complying with the various sanctions programs administered by OFAC. The latest changes to the SDN List may appear here prior to their publication in the Federal Register, and it is intended that users rely on changes indicated in this document. This publication of Treasury’s Office of Foreign Assets Control (“OFAC”) is designed as a reference tool providing actual notice of actions by OFAC with respect to Specially Designated Nationals and other persons (which term includes both individuals and entities) whose property is blocked, to assist the public in complying with the various sanctions programs administered by OFAC. The latest changes to the SDN List may appear here prior to their publication in the Federal Register, and it is intended that users rely on changes indicated in this document. Such changes reflect official actions of OFAC, and will be reflected as soon as practicable in the Federal Register under the index heading “Foreign Assets Control.” New Federal Register notices with regard to Specially Designated Nationals or blocked persons may be published at any time. Users are advised to check the Federal Register and this electronic publication routinely for additional names or other changes to the SDN List. Intelligence has played an important role in the exercise of the responsibilities and operations of the Treasury Department since the Department assumed its enforcement responsibilities in 1789. The mission and culture of Treasury’s Office of Intelligence and Analysis builds on this strong tradition of intelligence and national security at the Department. The OCC, Board, FDIC, and SEC (individually, an “Agency,” and collectively, “the Agencies”) are requesting comment on a proposed rule that would implement Section 619 of the Dodd-Frank Wall Street Reform and Consumer Protection Act (“Dodd-Frank Act”) which contains certain prohibitions and restrictions on the ability of a banking entity and nonbank financial company supervised by the Board to engage in proprietary trading and have certain interests in, or relationships with, a hedge fund or private equity fund. U.S. Department of the Treasury Overview of the Government of the Islamic Republic of Afghanistan 1390/2011 Budget Process from May 6, 2011. More than two years have passed since the Emergency Economic Stabilization Act of 2008 (“EESA”) authorized the creation of the Troubled Asset Relief Program (“TARP”). On October 3, 2010, Treasury’s authority to initiate new TARP investments expired, marking a significant milestone in TARP’s history but also leading to the widespread, but mistaken, belief that TARP is at or near its end. As of October 3, $178.4 billion in TARP funds were still outstanding, and although no new TARP obligations can be made, money already obligated to existing programs may still be expended. Indeed, with more than $80 billion still obligated and available for spending, it is likely that far more TARP funds will be expended after October 3, 2010, than in the year since last October when U.S. Treasury Secretary Timothy Geithner (“Treasury Secretary”) extended TARP’s authority by one year. In short, it is still far too early to write TARP’s obituary. The Kingpin Act blocks all property and interests in property, subject to U.S. jurisdiction, owned or controlled by significant foreign narcotics traffickers as identified by the President. In addition, the Kingpin Act blocks the property and interests in property, subject to U.S. jurisdiction, of foreign persons designated by the Secretary of Treasury, in consultation with the Attorney General, the Director of Central Intelligence, the Director of the Federal Bureau of Investigation, the Administrator of the Drug Enforcement Administration, the Secretary of Defense, and the Secretary of State, who are found to be: (1) materially assisting in, or providing financial or technological support for or to, or providing goods or services in support of, the international narcotics trafficking activities of a person designated pursuant to the Kingpin Act; (2) owned, controlled, or directed by, or acting for or on behalf of, a person designated pursuant to the Kingpin Act; or (3) playing a significant role in international narcotics trafficking. U.S. Treasury Los Zetas and Gulf Cartel Perpetrators of Mexican Drug Trafficking Violence Organizational Chart from March 2010 and July 2009. 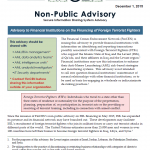 This report details key findings of the Financial Crimes Enforcement Network’s (FinCEN) assessment of Suspicious Activity Reports (SARs) filed from May 2, 2007, through April 30, 2008, by insurance companies and includes some preliminary observations about SARs filed from May 2008 through October 2009. It compares the results through April 2008 with a similar study of the first year of required reporting by segments of the insurance industry (May 2, 2006, through May 1, 2007). FinCEN analyzed insurance filings to identify typologies, patterns, and trends related to filing volume, filer location, subject details, characterizations of suspicious activities, insurance products, and other relevant information. Analysis includes summaries of SAR narratives identifying reported money laundering risks and vulnerabilities. In identifying potential trends, FinCEN reached out to representatives of the Bank Secrecy Act Advisory Group (BSAAG) to better understand what the industry is seeing with regard to these trends. That information is summarized in the Significant Findings section. Systemically Significant Failing Institutions (“SSFI”) Program. Under the stated terms of the SSFI program, Treasury invests in systemically significant institutions to prevent their failure and the market disruption that would follow. As of September 30, 2009, Treasury, through SSFI, had made and is committed to make further investments in one institution — American International Group, Inc. (“AIG”). This support was provided through two transactions — $40 billion for the purchase of preferred stock from AIG to repay debt owed to the Federal Reserve and approximately $29.8 billion for an equity capital facility that AIG can draw on as needed. As of September 30, 2009, AIG had drawn down $3.2 billion in equity from the capital facility. See the “Systemically Significant Failing Institutions” portion of this section for a more detailed discussion of the AIG transactions. In the fall of 2008, the Federal Reserve and Treasury faced several key decisions about the future of AIG. After attempts to find private-sector financing failed, they chose to provide assistance to AIG rather than allow the company to file for bankruptcy. FRBNY officials believed that an AIG failure would pose considerable risk to the entire financial system and would have significantly intensified an already severe financial crisis. FRBNY was concerned about the effect of an AIG bankruptcy on key sectors of the market, such as retirement accounts and the credit markets. FRBNY adopted in substantial part the economic terms of a draft term sheet under consideration by a consortium of private banks, the terms of which included a very high interest rate. The Intelligence Authorization Act of Fiscal Year 2004 created the Treasury Department’s Office of Intelligence and Analysis (OIA) and made it responsible for the receipt, analysis, collation, and dissemination of intelligence related to the operation and responsibilities of the Treasury Department. By itself, the Troubled Asset Relief Program (“TARP”) is a huge program at $700 billion. As discussed in SIGTARP’s April Quarterly Report, the total financial exposure of TARP and TARP-related programs may reach approximately $3 trillion. Although large in its own right, TARP is only a part of the combined efforts of the Federal Government to address the financial crisis.